I picked up a pair of Plantronics BackBeat GO Bluetooth headphones because there are times that I hate having a wire between my head and my pocket. Yes, I’d be sacrificing sound quality, and it’s another thing to charge, but for certain activities, its benefits could outweigh those negatives. Since it uses Bluetooth to communicate with my iPhone, the only wire to be dealt with is the one that connects the two earbuds, and it is placed out of the way behind your neck. The sound quality is acceptable – the highs aren’t as crisp and clear as a good pair of wired in-ear earbuds – but that’s to be expected. 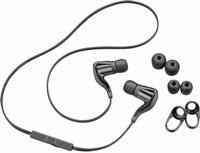 Since it has a battery and Bluetooth circuitry to deal with, the earbuds are larger and heavier than wired ones, but not uncomfortably so. The main problem with them, and something I hope can be fixed with a firmware update, is that their maximum volume is too low. Even taking into account the fact that they are in-ear earbuds and block some external noise, while sitting at home listening to a spoken-word podcast (the wonderful Stuff You Should Know), the maximum volume is the most comfortable. Where this really presents a problem is where I hoped to use them twice a day for five days of the week: the NYC subway. In the subway, their low maximum volume makes them sound on par with the stock Apple iPhone headphones – in other words, you can’t hear a thing when a train is entering or leaving the station, and the steady stream of announcements inside the car will drown out whatever you’re listening to. AC/DC should never, ever, be upstaged by Carolyn Hopkins. I’ve used them while running, where the lack of wire is a huge plus, but their size and weight combined with some sweat and the bouncing movement can make them fall out. They come with an attachment that is meant to help keep them in your ears, but it doesn’t work very well. Either an external hook or a better internal stabilizer would make them better suited for running or other exercise. I’m going to keep the headphones because they are very convenient to use around my apartment while washing dishes, vacuuming, and listening to music or watching TV and movies on my iPad on my balcony, but they simply aren’t loud enough to use while out on the streets, which is a shame.